I'm using my personal computer and trying to mine bitcoins. I'm rather new to this and was wondering if I did everything alright. Thanks in advance. You're about 4 years late for CPU mining and 3 years late for GPU mining: Even if you get bfgminer to run, your PC will not be powerful enough to even find shares that would be accepted by a pool. See e.g. Can I do mining with a normal PC? Not the answer you're looking for? 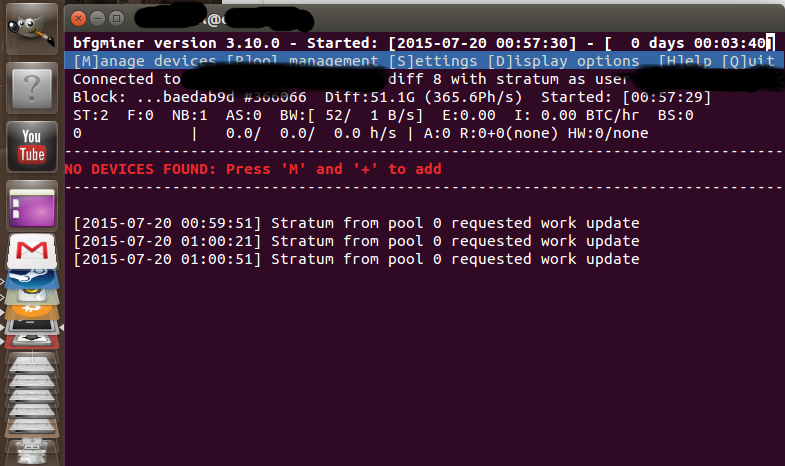 Browse other questions tagged ubuntu bfgminer miner-configuration cpu-mining stratum or ask your own question.